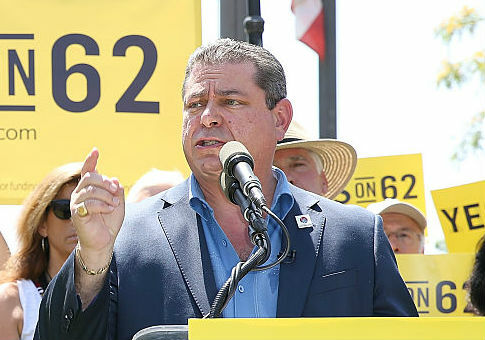 Three current and former staffers for the California Democratic Party filed a lawsuit this week against the party and its former chairman, Eric Bauman, accusing top officials of knowing about his sexual misconduct and tolerating a culture of harassment and discrimination. The complaint, which was filed in Los Angeles County Superior Court, describes a hostile work environment in which drinking during the day was tolerated along with sexual and other inappropriate comments. The suit also charges some party leaders with retaliating against those who reported the allegations of harassment, the Los Angeles Times reported Friday afternoon. Bauman, though his attorney, declined to comment, saying he has not been served with "any lawsuit and has no further comment at this time." The legal action comes during a tumultuous time for the California Democratic Party. Despite Democrats sailing to victory in several key elections in the state in November, Bauman was forced to resign following multiple reports of sexual misconduct, drinking, and inappropriate behavior toward party staff members and activists. At least 10 party staffers and activists came forward to say that the inappropriate behavior, comments and inappropriate touching had gone on for more than a decade and was widely known in Democratic circles. After first trying to hang onto his chairmanship, Bauman resigned after party officials opened an investigation into his behavior and then-Gov.-elect Gavin Newsom called on him to step down. Bauman had been the chairman since May 2017; he was the first openly gay person to serve in the top party role in the state. In announcing his retirement, Bauman said he would check into an alcohol rehabilitation center. Some of the allegations stem from a campaign bus tour aimed at rallying support for California Democratic candidates in the days before the Nov. 6 midterm elections. The lawsuit claims that the party paid for additional insurance coverage to allow alcohol consumption on the bus and that staffers saw Bauman drinking heavily as early as 9:30 a.m., the Times reported. After hearing about the complaints, Christine Pelosi, daughter of Speaker Nancy Pelosi and chair of the party’s women’s caucus, uninvited Bauman’s bus tour from a San Francisco rally for Democratic candidates featuring her mother, the lawsuit says. Christine Pelosi is the legal counsel for the "We Said Enough" campaign, founded in 2017 in response to the #MeToo movement taking on sexual misconduct in Sacramento and across California and the nation. Pelosi told the Times that she told party officials not to have the tour stop in San Francisco and spoke to Democratic officials in an attempt to "navigate an informal solution." "I wanted them to be heard," Christine Pelosi said. "I wanted Eric to get help."